When choosing a Bible there are several features that you will want to pay close attention to. These features will determine how the Bible can best be used and how long it will last. Translation – it is important to choose a translation that you will be comfortable using for several years. Literal (word-for-word) translations are great for study and are good for reading, while functional (thought-for-thought) translations, while not as good for study, excel at readability. Cover – choose the highest quality and most durable cover you can afford. Choices include imitation leather, bonded leather, hard-cover, genuine leather, calfskin, goatskin. Calfskin and goatskin are more durable but also more expensive. Binding – I recommend a sewn binding, also known as Smyth sewn. A sewn binding will allow the Bible to lay flat and typically last longer than glued bindings. Paper – paper comes in various thicknesses, colors, and opacities. Usually highly opaque paper has improved readability and is easier to turn. Thicker paper is good for notes and highlighting. Look in the gutter to determine the color of the paper. Some colors are easier to read for long periods of time. Font – look for a font that you will enjoy reading for long periods of time and for many years. Things to look for include a print that is consistent, words that are not too close together, and a size, darkness, and style that’s comfortable to your eye. Large fonts are great for reading and preaching. Layout – there are two basic layouts: single column and double column, and you can find Bibles with verse-by-verse and paragraph format in both layouts. 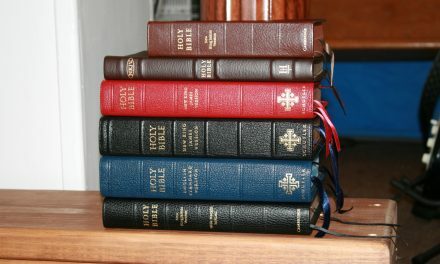 Many consider verse-by-verse easier for preaching and paragraph easier for reading. Study tools – study tools include references, concordance, maps, lists, commentary, etc. Tools add to the size and weight and you might not need them in every Bible. Cross references are among the most used tools. You can find reviews of Bibles with these features right here at Bible Buying Guide by using the menu or search box.